Identify a problem. Look for a book or an expert to help me. Research on the internet. Ask all of my friends. Observe what everyone else around me is doing. Sit and wonder about it. Make a plan. Get (more than) a little overwhelmed by my plan. Get scared. Get more stuck. Decide that my problem might need a little more research and begin the cycle again. I was stuck in thinking about the multitude of ways that I wanted to living my life differently… but, in my overwhelm, I wasn’t doing anything differently. I was stuck in the intellectual stage of discovery and knowledge accumulation. And really, I had no freaking clue where to actually begin. Everything felt so big and I felt so small. Researching felt infinitely easier than the risk of trying something new and failing. I also believed on some level that I was a problem that needed to be fixed. A problem so complex and special that it warranted all of that extra research. I wanted to be a problem, because problems have solutions. Problems lend themselves to a quick fix. To a solution handcrafted by someone smarter than myself. But I wasn’t a problem. I’m not a problem. What I was, was deeply deeply afraid. Afraid of shining. Afraid of not being enough. Afraid of being too much – of having too many emotions to navigate. Afraid of trusting my intuition. Afraid that this whole thing of “getting to live exactly how you want” was a lie and I would have to go back to my life as I knew it. Afraid that I was special. Afraid that I was not special enough. You are special. Your problems are not. We all struggle with something – even the people who seem like they have it all together. You are not a problem to be fixed. You do not have to over complicate it. You can choose not to overwhelm yourself into a place of inaction. You get to determine the pace and the structure of what “living your life how you want to” looks. You get to experiment – and get it wrong. You get to recalibrate and end up with something a million times better than you ever could have imagined. But, you have to choose to put down the self-help book or pause before hiring the next coach or sit with yourself before you press BUY NOW on the next e-course. You get to choose to remember that you are not a problem to be fixed and thus that book/person/program will not fix you. You get to choose that if it is action that you’re craving, it is your job to start doing something – anything. It doesn’t have to be pretty. It doesn’t have to be perfect. Claim your desire to move forward and start anywhere. Ask yourself… What do I want? Where am I try to go? If I were really honest with myself, what is in my heart to create? Then, ask yourself… What one small step that I can take in that direction right now? You may still decide that you want the book or the coach or the program, but it is my hope that you make that decision out of a place of adoration and devotion to your own sweet spirit – and the knowing that getting support would feel deliciously good. Support gathered from that place has a delicious, celebratory feel to it. It is about plying yourself with resources to aid in your success, instead of that panic-induced search for something to save you from yourself. You may decide not to. That’s ok too. I promise you there will be another thing to sign up for coming up soon. You may decide to start with taking a little bit of action to see where it takes you. You do not need to do everything today. In fact – don’t even try to do most of the things today. Start with one thing. One glass of water, one loving word mumbled to yourself, one act of self-kindness, one good choice. 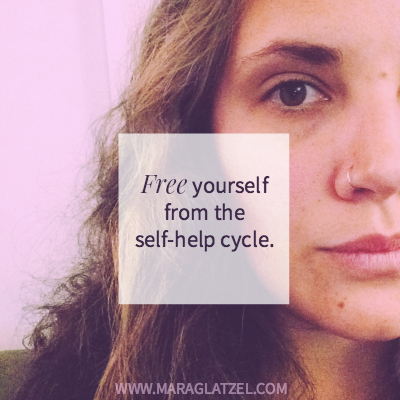 Choose to hop off of the cycle. Choose to reclaim your life in small pieces and moments of clarity. They will add up, I promise. Know this: each and every starting point is exactly the same. You do not have to wait for the right one. Pick any spot. Start there. Don’t be too precious about the process. The process of living intentionally is going to be a bit messy. You might have some feelings. And that is totally ok.
You might need help. That’s ok too. Ask for it. Seek out communities where you can be yourself and share vulnerably. Hire someone to hold space for you while you sort it out. Gather an entire team to support you in taking action if you’d like. Allow these small acts to expand your capacity for living remarkably, vibrantly. Pour small choices into the cracks and crevices between responsibility and your to do list, feeling into the way that doing so subtly starts to reweave the fabric of how you’re living. Give yourself permission to take imperfect action. A note: For many years I made myself into a problem to be fixed to justify the fact that I really loved exploring myself – taking classes, reading books, working with people. I had to unbraid this for myself to teach myself that it is truly ok to love those things – and to take them merrily. I didn’t have to be a mess in order to deserve them. I was allowed to spend my money on them because they lit me up… and that’s the point. So, if that’s a piece of it for you, an extra dollop of permission: You can love it. You say yes to it. But, skip the part where you call yourself a mess in order to deserve it.